Early memories of New Mexico light and of being on the land echo throughout my life, and in my artwork — in visions of what I feel is beautiful, above and below see level... Ideas for artwork spring from my experiences, from traveling throughout Asia — and memory cultivates imagination. 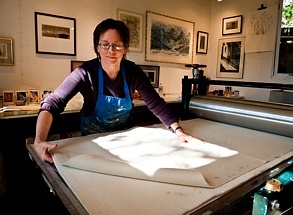 I make prints, and paper, and paintings — as witness to my life. The monotype method of printmaking has painterly characteristics and a quality of being immediate, even if it might take extended periods of time, and many passes through the press. A monotype has unique print sensibility, being a one-of-a-kind and still a print. I feel a kinship with this method and most of my prints are monotypes. Making paper is simply fun. The basic materials of fibers and water combine to open up a rich field of creative possibilities. I frequently print an engraved line on the matrix of a poured paper pulp composition. Handmade paper takes a printed line beautifully. The flow in paper making and its wet to dry nature mirrors being alive; everything changes, what is once fragile becomes strong and vice versa, what is once raw and coarse becomes clarified and fine. I love the flow. Painting is like standing in a stream. The image takes form in the current of where you stand. The stream has its own momentum. If you are there with paint and brush, the confluence of your materials and the stream shape the result. My artwork is a way of understanding meaning, of sharing experience. The art process reflects how the mind works in this combination of using materials at hand and watching the mind. Something gets created in the world, an intentional communication, something to see. Making art is a gift of alchemy, through me, and now to you.